New traffic diverter on SE Ankeny at 15th. 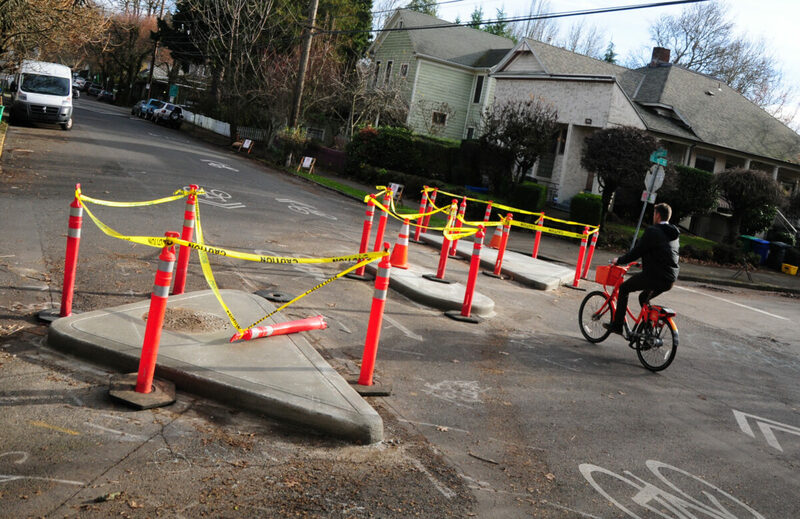 With two new traffic diverters installed in the past week, the City of Portland continues to fulfill its promise to defend the low-stress biking environment on neighborhood greenways. Ankeny pavement markings, looking southwest. There’s been a lot of coverage of the SE Ankeny bikeway improvements and the city posted their plans, but I rolled through there Friday and noticed it’s actually becoming a reality. The diverter is diagonal with two exceptions: the center section is in line with the bike path and one side of the diverter had to be placed differently to accommodate a manhole cover. What do you think? Make sure to let the city know. 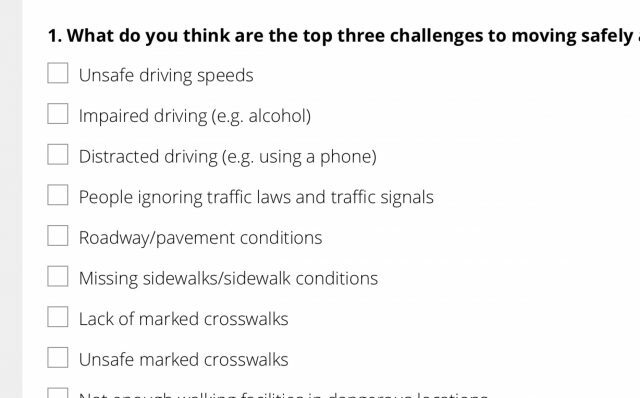 The Portland Bureau of Transportation wants your input on two very important issues: the Clinton Street traffic diverters and Vision Zero. 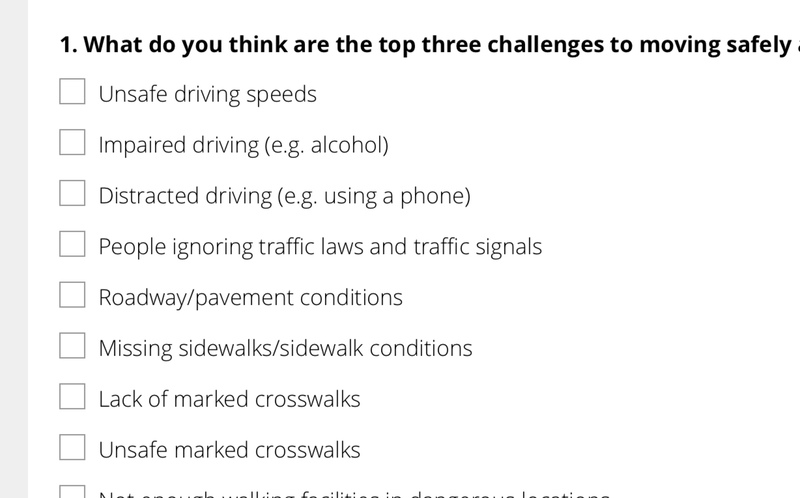 They’ve released an online survey for each of them and we’d like to officially encourage you to take a few minutes and fill them out. 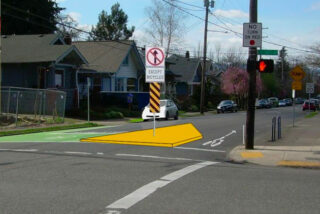 A new diverter at SE 17th and Clinton, designed to reduce automotive through traffic on the major bike route. The other new diverter is at 32nd. 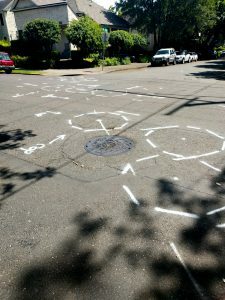 It’s been almost two years since we started reporting on the call by some Portlanders for traffic diverters on Clinton Street, one year since Mayor Charlie Hales and Commissioner Steve Novick approved them, and five months since two were installed. So as the city prepares for similar diverters on Ankeny and considers them someday on Northeast 7th, we wondered: How are things going? I spent 90 minutes on Clinton Wednesday during the evening rush hour to ask passers-by what they thought. 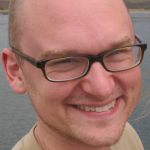 Let no one say that Terry Dublinski-Milton lacks vision. 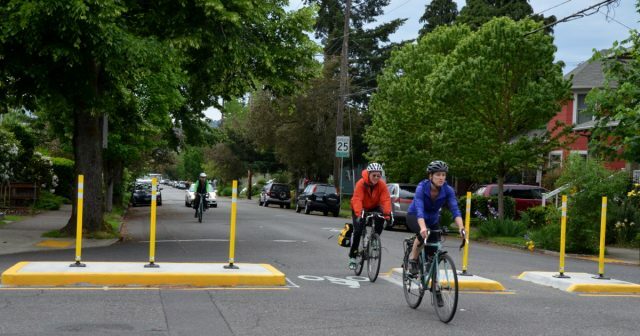 The advocate for better neighborhood greenways — back in 2012, before he teamed up with BikeLoudPDX, the Southeast Uplift neighborhood coalition and other groups, he founded a niche greenway advocacy campaign called C.O.P.I.N.G. 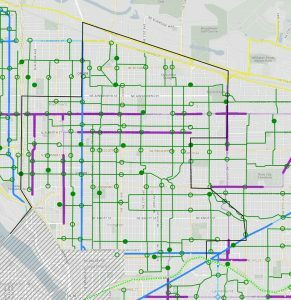 with Bikes — unveiled a map yesterday of what it’d look like if traffic diversion were required “at or near every greenway crossing of a neighborhood collector, corridor or civic corridor” in inner northeast Portland. Neighborhood greenways are low-traffic, low-stress side streets, mostly developed in Vancouver BC and Portland, that have become the backbone of Portland’s biking network. 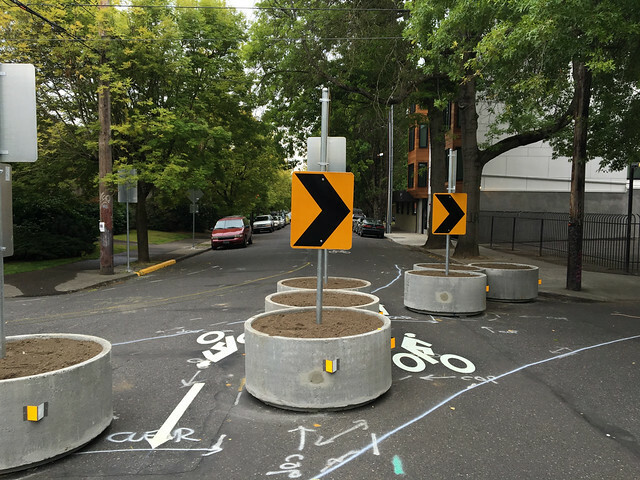 The city has long used diverters to reduce auto traffic on a a street; last year it created formal guidlines for determining when to install a diverter to keep auto traffic on a neighborhood greenway below 2,000. 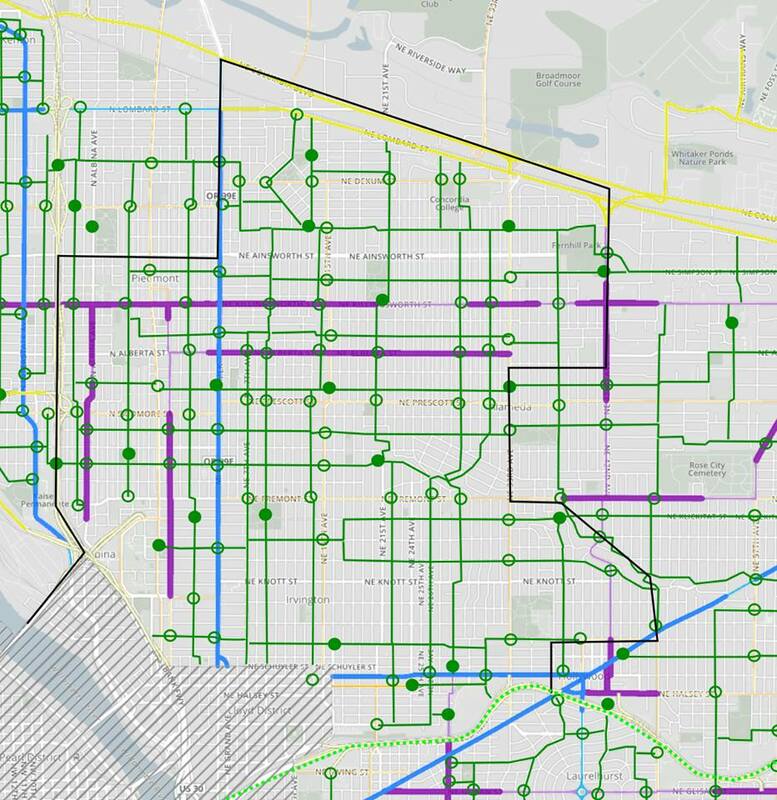 The debate over the best route for a future NE 7th/9th neighborhood greenway is, for the moment, largely about appearances. But in this week’s battle for appearances, backers of a 7th Avenue route are definitely winning. 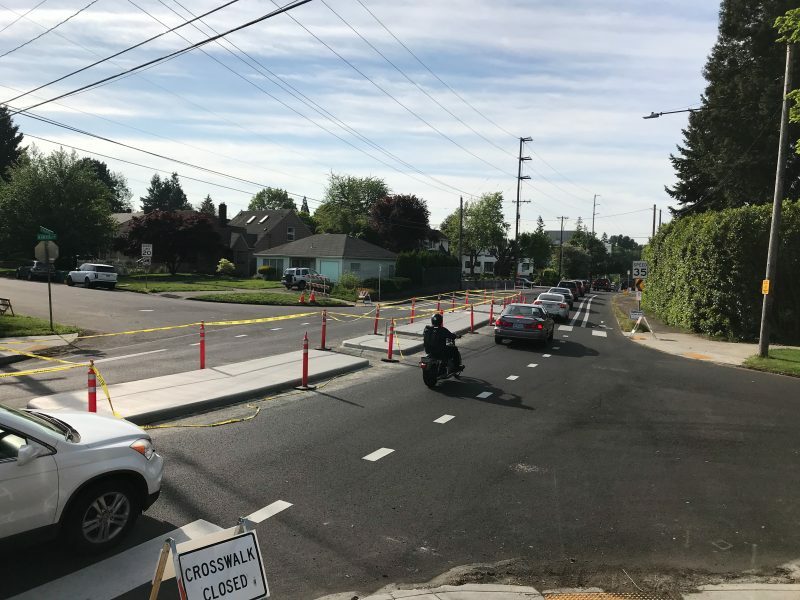 As we mentioned in Monday’s coverage of this issue, an anonymous supporter of a 9th Avenue route launched a petition on Sunday in which he or she suggested that a 7th Avenue route would send traffic spilling onto other small residential streets. As of this writing, it’s got 50 signatures. Yesterday morning, resident Montse Shepherd started a competing petition in favor of a 7th Avenue route, itemizing 16 reasons for that route. 26 hours later, it’s drawn 368 signatures. 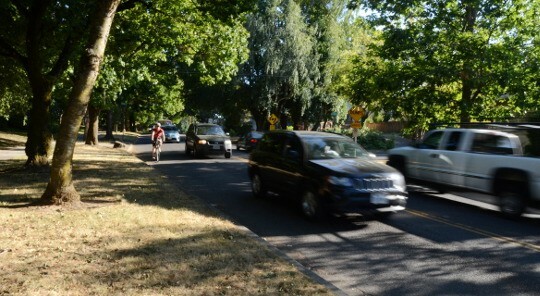 NE 7th Avenue is technically a local street, but it’s become heavily used by cars as an alternative to MLK. 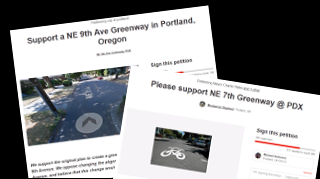 Advocates for turning NE 7th Avenue into a low-stress neighborhood greenway scored a significant victory this month, but opponents of that change are pushing back.